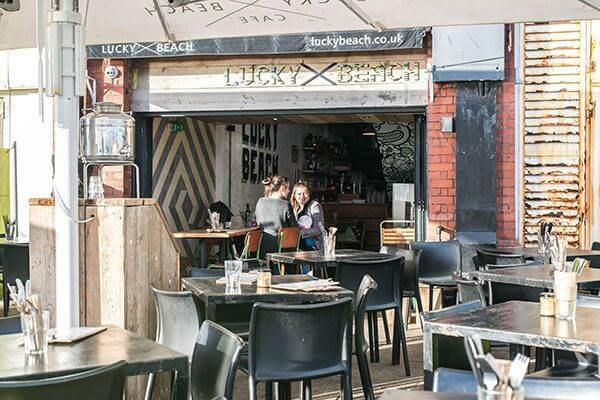 Lucky Beach is a restaurant on Brighton’s seafront inside what used to be a fisherman’s arch, just a 5 minute walk (if that) from Brighton Pier. 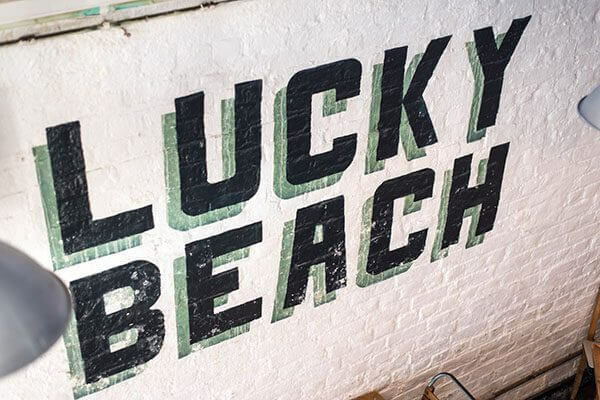 There’s a strong essence of sustainability in the way Lucky Beach is run, from the furnishings (which are all up cycled from various sources), to the food (which has come from local farms and mostly organic). 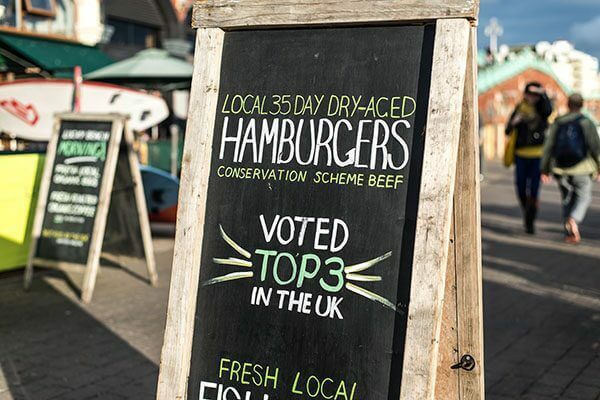 It’s even won a sustainable restaurant award, and been voted ‘Top 3 In The UK’ for their local 35 day dry-aged hamburgers, which are on the conservation scheme. The restaurant itself can seat up to 100 people, and there’s a variety of seating options to choose from. 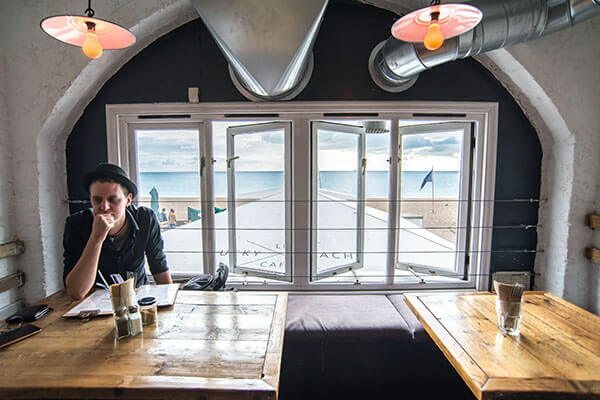 There are a couple of places outside including the tables and chairs on the beach, or inside, there’s an upstairs too where you can sit by the window and have a beautiful view of the sea. All of the furniture is ‘pre-loved’, for example the beach furniture is from the Royal Festival Hall, London; outside of the arch the furniture comes from London’s Tate Modern; then a little closer to Brighton there’s the interior furniture made from unwanted wood from Shoreham docks. With a mix of different furniture it looks eclectic yet still marries well, it’s bright and airy when you go inside, and at the back of the restaurant they’ve heightened the cosy feel from it’s smaller size and lack of windows by creating an atmospheric area. Like I said, there’s a good choice of seating with huge contrast of atmosphere depending what you’re feeling that day! 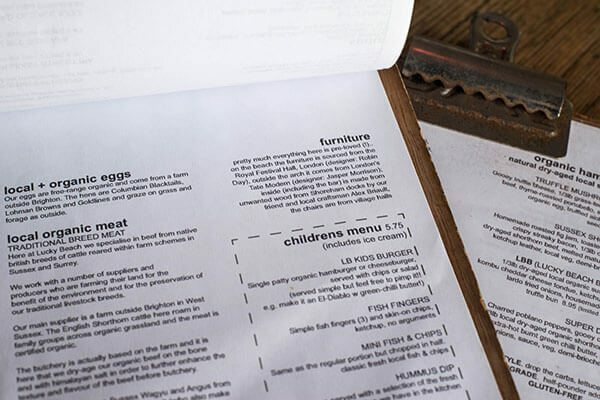 The menu has a good selection with some casual dialect taking you through it including their burgers, sandwiches, salads, fish, breakfast (served until 11.45am), drinks and smaller portions for children. The food seems to have some interesting twists, not an unnecessary twist but a gastronomic one! When looking at the menu I feel excited because there are lots of things I wouldn’t think to make myself at home, and that’s what I like to eat when I’m out – something that inspires my own cooking. It’s great to see thoughtful vegetarian/vegan options too that sound just as exciting as the ones containing animal products. We were seated by our friendly waitress, we chose the window seat upstairs where we had a great view of the sea with it’s golden tinge from the sun starting to set. Looking at the drinks menu I was interested by their cold + fresh section; some really great flavour combinations. I settled on the APPLE + RHUBARB SODA with Fresh Thyme & Ginger (£2.75). 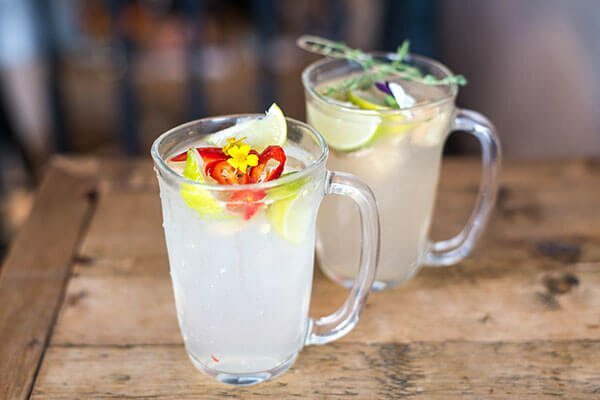 Dan went for the SPICY FRESH GINGER LIMEADE with Fresh Ginger, Lime, Fresh Red Chillis & Ginger Beer (£2.85). When they came they looked very pretty in their handled glasses decorated with edible flowers (“grown by Ben”). Not only did they look good they tasted pretty good too, they were fresh and full of flavour, Dan’s Spicy Fresh Ginger Limeade really packed a punch! They were almost like non-alcoholic cocktails, and the two we had chosen were just the right amount of sweet and sour. For our burgers, I settled on the burnt poblano & halloumi burge; Char-grilled halloumi, thyme roasted flat mushroom, burnt poblano & red peppers, shredded winter greens & smokey aioli (£6.75). I decided to go for their option of “Protein-style- drop the carbs, lettuce wrap.” Dan had ordered the LBB (Lucky Beach Burger); 1/3lb dry-aged local organic sussex beef, kombu cheddar cheese fondue, ketchup leather, lardo fried onions, housemade pickles & truffle bun (£8.95). We ordered some of the blue cheese and bacon fries; Gooey blue cheese sauce over skin-on fries, bacon crumbles & fresh herbs (£4.75), but as Dan has a strong dislike for blue cheese we asked if it’d be possible to have half blue cheese and half cheddar, this didn’t seem to be a problem and they said it’d be fine. When our food arrived, we were really pleased with our choices, and everything was presented really well on some lovely ceramic plates. I love it when restaurants present their food on nice plates and bowls because it makes the food look more interesting. 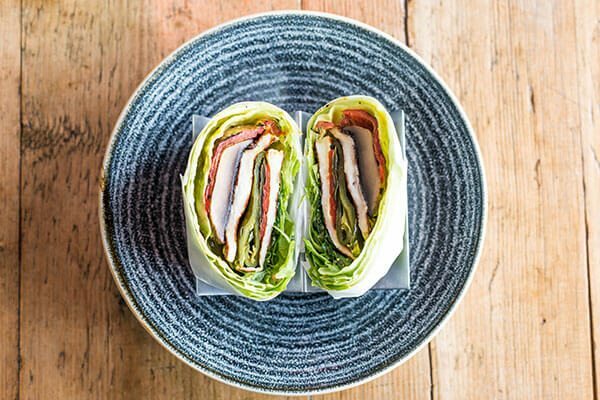 I was positively surprised at the halloumi burger in the lettuce wrap because it looked immaculate, the way it had been carefully rolled, layered and folded then cut in half so you can see each layer of ingredient was very pleasing. I liked the little metal stand it came on too, so the ingredients didn’t spill out. The flavours and textures were delicious, it was fresh, not greasy and without the bun it was a lot lighter therefore leaving you feeling satisfied but not stuffed. At £6.75 too, it was definitely value for money. Dan’s burger looked great with all the colours of the ingredients layered up inside the bun. The 35 day dry-aged hamburger had a slight pink colour in the middle, so cooked very nicely. The pickles really tasted of dill and carried through the burger well, and the cheese fondue was creamy, but one of the most interesting things about the burger was actually the ketchup! It was a ketchup leather, which looked like a square sheet of red plastic, but if you bite a little off it’s completely ketchup in flavour! 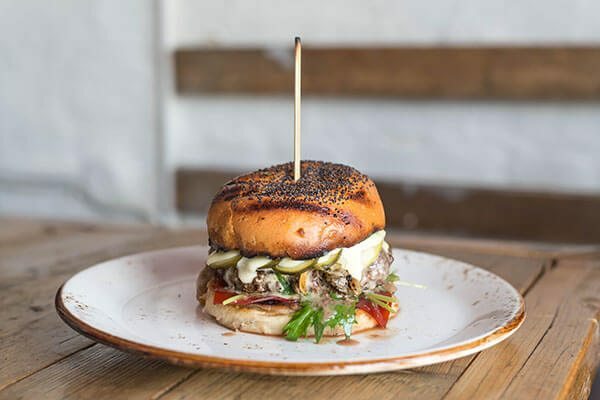 This is an ingenious idea for burgers, because you get all of the flavour but not so much of the mess as there’s less wet texture and juices, thus creating a (slightly) cleaner burger-eating-experience. The chips were well seasoned and had a lovely crispy snap. 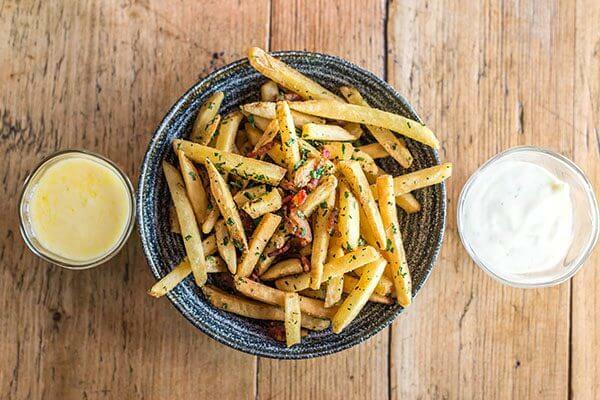 The cheeses came in a little pot each next to the chips and had been melted so you could dip or pour to your hearts desire. They were a generous portion size that was plenty to share between two, even three if ordering a burger each. Overall I was very happy to have been given the opportunity to review the burgers at Lucky Beach. I loved the innovation throughout the restaurant from the interiors and decor, to the food itself. After looking at their breakfast menu I want to go back and try something from that along with another fruity soda drink. 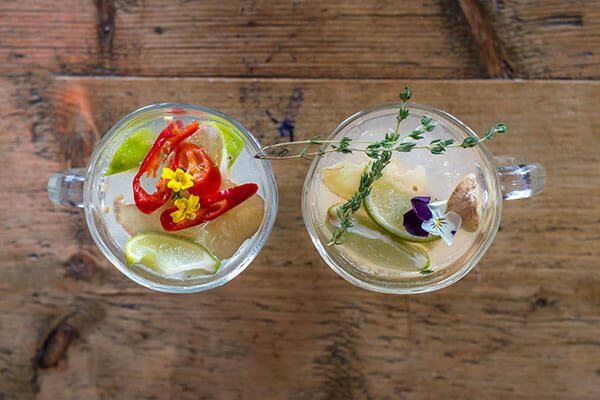 They’re also putting on various pop-up events with michelin star chefs which will be on the cards, and there’s talk of a Lucky Beach 2 opening soon in the Temple Bar Pub on Church Road, so it’s exciting times for this Brighton beach restaurant!